Messages are not stored in Search Folders. Search Folders are virtual folders that contain views of all e-mail items matching specific search criteria. Search Folders display the results of previously defined search queries. The e-mail messages shown remain stored in one or more Outlook folders. Any e-mail item with a flag appears in the For Follow Up Search Folder. E-mail items that are larger than 100 kilobytes (KB) appear in the Large Mail Search Folder. All unread e-mail items appear in the Unread Mail Search Folder. Right click the Search folder icon to create a new Search folder. When you create a Search Folder, you have a number of options to choose from, such as "Mail with attachments" or "Mail from specific people." You can also create your own custom Search Folders, defining specific search criteria that e-mail messages must meet to be displayed in the Search Folder. Each Search Folder is a saved search that is kept up-to-date, monitoring all of your folders for any item that matches the search criteria of the Search Folder. When you delete a Search Folder, the e-mail messages shown in the Search Folder are not deleted, because those items are never saved, only viewed, in a Search Folder. However, if you open or select one or more e-mail messages shown in a Search Folder and delete the e-mail messages, the messages will be deleted from the Outlook folder where they are stored. Outlook's search folders retain the results and remain up-to-date by adding new messages to the search folder as they arrive, provided you view the contents at least once every 8 days. If you use the folder less often, Outlook will need to rerun the search. Because Outlook has a limit of 20 search folders, use Advanced Find for less used searches. When you save the Advanced Find search, it's almost as fast and convenient as Search Folders. Advanced Find allows you to save the searches as Office Saved Searches (*.oss). Choose File, Save Search. Once saved to your hard drive, you can copy them to any folder within Outlook, or drop it on the Outlook bar for easy Access. To run the search, just double click on it. Hoax e-mail, at one time, threatened to overflow offices and homes with deleted electrons. Some of the offers and "insights" seemed so real and they came from respected senders. That California Bill AB 2651 Outlaws Christian Foster Parents? There are Formosan Termites in Mulch from New Orleans? The Outlook bar is handy to jump from Mail to Contacts to Calendars, but you can do more with it. 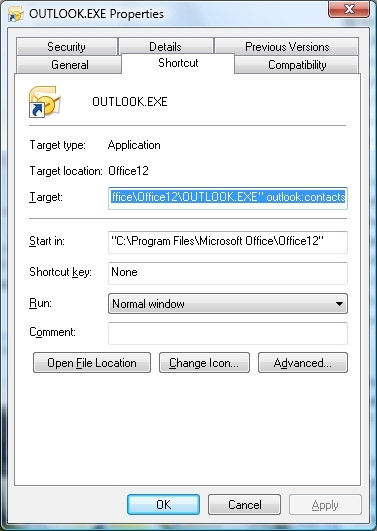 If you can locate the EXE of a program, it can be dragged to the Outlook bar to create a shortcut. Here is a collection of more things that can be done with hyperlinks. Efficiency: emails that get to the point are much more effective than poorly worded emails. Protection from liability: employee awareness of email risks will protect your company from costly law suits. It's not my glasses, the print's too small! Changing the Font Size of the Reading Pane in Outlook: Impossible? You can only change the font size for the Reading Pane in Outlook 2003 by right clicking the tiny grey border around the Reading Pane. When you do click the menu item then move to another email, the option switches back to Medium for the next message. The menu items have no effect (the font sizes don't change) on 90% of corporate mail including RTF and WordMail. Is this totally broken or am I totally broken?" Some users prefer the better visibility of a larger font size for reading their messages in the Reading or "preview" pane. You can make the text or font in the pane larger or smaller by using the scroll wheel on your mouse. Using the scroll wheel is the only way you can change the text size, although more options are being considered for a future version of Outlook. Use the Reading Pane, highlighted in red, to preview your messages without having to open them. Click in the Reading Pane, press CTRL, and roll the scroll wheel. Rolling the wheel away from you makes the text bigger, rolling it towards you makes the text smaller. Note The text size doesn't persist when you change views. If you go to your Calendar, for example, or another mail folder like Sent Items, the text goes back to the default size. For information about the OL interface, see Slipstick.com. With RSS entries, I average 500 or more messages a day. Here's a suggestion about how to tame the problem. "You clear up one problem and delete the e-mail message -- and meanwhile six others pop up in your Inbox. Microsoft Office Outlook can flag messages with priorities, set reminders, and flag messages for follow-up, so that you can glance quickly at Outlook and know immediately what needs to get done first." Spam is as ubiquitous in email as it is in an Hawaiian restaurant. These links may help you distinguish pork shoulder from the other stuff. "This document is intended to provide a comprehensive introduction to the behavior of email headers. It is primarily intended to help victims of unsolicited email ("email spam") attempting to determine the real source of the (generally forged) email that plagues them; it should also help in attempts to understand any other forged email. It may also be beneficial to readers interested in a general-purpose introduction to mail transfer on the Internet. " "The ability to read and decipher email headers is a useful skill to learn for tracing messages to their original source and diagnosing many other problems. Headers may contain a lot of information but the most important information will always be contained in every email header." "Spam is an incredible problem and it is getting worse - your e-mail address is a commodity and if you put it on a web page, it WILL eventually be found, spammed and sold to other spammers. The problem is that you have a web page and you need to make it possible for people to send you e-mail from your page but you don't want to get bombarded with spam - what can you do? First you need to understand what is likely to happen. The most likely scenario is that an e-mail harvesting robot will find your page and look though it trying to find e-mail addresses. This robot may be programmed to look for a particular list of possible characters on either side of the @ in your e-mail address or it may look for the "mailto:" in your e-mail link or any number of other tricks." If you have a need to protect the contents of your email messages, these links should point you in the right direction. Digitally sign an e-mail message. Digital signing provides nonrepudiation and verification of contents (the message contains what the person sent, with no changes). Encrypt an e-mail message. Encryption helps to ensure privacy by making the message unreadable to anyone other than the intended recipient. Sending an e-mail message with an S/MIME receipt request. This helps to verify that the recipient is validating your digital signature (the certificate you applied to a message). Adding a security label to an e-mail message. Your organization can create a customized S/MIME V3 security policy which can add labels to messages. An S/MIME V3 security policy is code that you add to Outlook that runs automatically to add information to the message header about the sensitivity of the message content. For example, an Internal Use Only label might be applied to mail that should not be sent or forwarded outside of your company. Why let the sleaze balls have all the fun? We've traded garbage cans full of unsolicited mail for full blocked or deleted bins. Here is a site that has information on stopping the bad guys, including information from their perspective. "A number of far-sighted people have been saving all their spam and have put it online. This is a valuable resource for anyone writing Bayesian filters." "The links on this page are to companies that provide the infrastructure of spam. It's fairly disgusting reading, but a quick scan will give you some ideas about filtering." "These articles about spammers are very helpful in understanding how to stop spam. For example, complaining to the ISPs that spammers use does seem to inconvenience them. And best of all, so does filtering. In one article below, a spammer complains that filters have increased his costs 1,000-fold. That's exactly what we want to hear. New laws and policies may stop spam. Making it unprofitable certainly will." There's not much room in an Outlook icon to communicate information. Robert Sparnaaij, MVP-Outlook, has put together a legend of these tiny pictures with their meanings. "Many of the most common computer viruses and other malicious software are spread through e-mail attachments. If a file attached to an e-mail message contains a virus, it's often launched when you open the file attachment. No matter what e-mail program you use or what version of Windows you're running, you can help avoid some viruses by following a few basic rules. If you use the latest version of Outlook or Outlook Express and if you use the latest version of Windows, there are a few unique enhancements and default settings to help keep you from accidentally infecting your computer with a virus. Dealing with e-mail attachments in Outlook Express"
By using a rule that you create, Outlook can examine each message that you receive for certain characteristics and then automatically forward or redirect any message that matches the characteristics to another e-mail account. There are a couple of ways of doing it: forwarding and redirecting. When a rule automatically forwards a message you receive, it leaves a copy of the message in your Inbox or in the folder to which the message was originally delivered. The rule then adds the designation "FW:" to the beginning of the Subject line, changes the message formatting, and then forwards the message to the account specified by the rule. The recipient represented by the account also sees that the message came from you. When a rule automatically redirects a message you receive, it also leaves a copy in your Inbox or in the folder to which the message was originally delivered. The rule then sends the message, unchanged, to the account specified by the rule. To the recipient, the message appears as though it came directly from the original sender. There is no indication that the message was delivered by way of your account. Here's how to stop Outlook from automatically filling in the e-mail address when typing the name of a contact in the To: field. 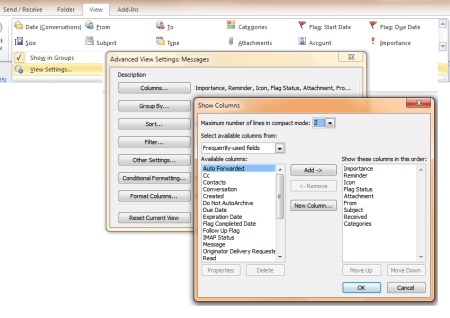 Outlook's Suggest Names feature helps speed up routine e-mail activities. However you may want to get rid of it when, for instance, you have two or more e-mail addresses that are similar and Outlook keeps choosing the wrong one. "Suggest names while completing To, Cc, and Bcc fields"
If Auto Suggest and name checking is not working, rename the *.NK2 file. Outlook will create a new one. You can rename or delete the NK2 file if you want to get rid of all addresses in your autocomplete file. Read and responding to e-mail from any computer. You can Access your mailbox without logging onto your corporate network. Manage your calendar. View your appointments and other upcoming meetings, especially if you're just checking e-mail and your schedule. View your tasks. Note You can only view tasks in the latest version, Microsoft Outlook Web Access 2003. Send or manage bulk e-mail and appointments. Handling large files or too many contacts can be slow. Access personal folders in Outlook. You can't Access Outlook folders you have saved at work. Access the corporate network. You will not be able to view files saved on the network or visit internal intranet sites. You could use brute force to enter data in an Outlook calendar that would count down to an event. Creating separate entries rapidly becomes tedious. Outlook MVP Diane Poremsky demonstrates a way to quickly combine a list in Excel (or other CSV type formats) with calendar entries in Outlook. It boils down to creating a list and importing into an Outlook calendar. "All the e-mail messages that you receive go through an e-mail server for your e-mail account. Depending on the type of e-mail account that you use, your e-mail messages are processed in one or more of the following ways. Messages remain on the server. Outlook connects to the server, and you can read or delete your messages. Messages are downloaded to a local data file called a Personal Folders file (.pst). Outlook connects to the local .pst file so that you can read and delete your messages. Copies of messages are downloaded and synchronized with messages on the e-mail server. Microsoft Exchange Server accounts provide this functionality by creating a local Offline Folder file (.ost). This file is used for working offline when you can't connect or don't want to connect to the e-mail server. This file is also used by the Cached Exchange Mode feature in Outlook 2003. E-mail account types differ in how e-mail messages are saved and synchronized with the e-mail server. For example, by default POP3 e-mail accounts delete e-mail messages from the e-mail server when downloaded into Outlook. However, you can customize how e-mail messages are retrieved and saved." When you retrieve e-mail messages from a POP3 ( Post Office Protocol. A common protocol that is used to retrieve e-mail messages from an Internet e-mail server.) e-mail account, the messages are deleted from the e-mail server by default after they are downloaded to your computer. For many people, this works great. 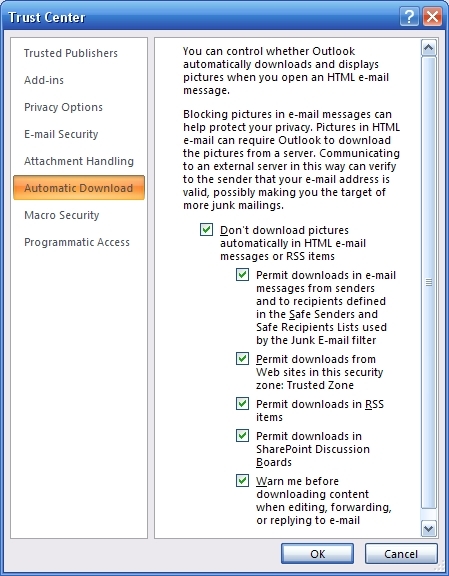 However, if you want to check your e-mail from multiple computers, you must configure Outlook to not delete the messages on your e-mail server. This scenario is most common for people who want to check their home Internet service provider (ISP) e-mail account from work and download the messages for permanent storage on their home computer. When you leave messages on your e-mail server, you can choose from several options to delete your messages. To make your choice, you need to consider several factors about your e-mail usage, such as how long you want the messages to be Accessible from multiple computers and the storage limits imposed by your e-mail server administrator. If you exceed your storage limit, you might be unable to receive new messages or might be charged additional fees. Typically, it is best to have one computer set to the default setting that doesn't leave e-mail messages on the e-mail server. When you use the computer to retrieve your e-mail messages, they are downloaded and deleted from the e-mail server. 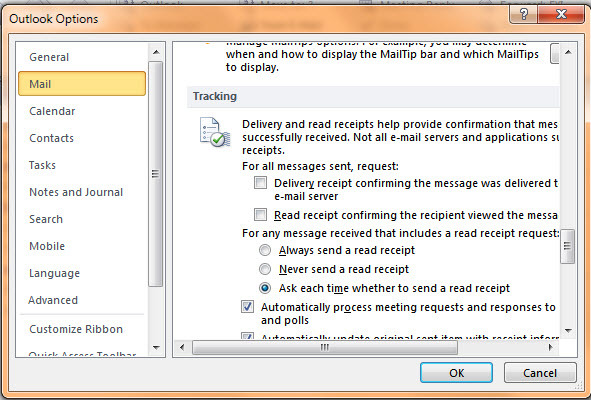 If you choose not to do this, Outlook allows you to select a time duration for leaving e-mail messages on the server. When you Access an IMAP (Internet Message Access Protocol) e-mail account, your messages are copied locally. However, the messages also remain on the e-mail server until you mark them for deletion and use the Purge Deleted Items command. When you Access an HTTP e-mail account, such as MSN Hotmail, your messages are saved on the e-mail server until you delete them. When you Access an Exchange Server e-mail account, your messages are saved on the e-mail server until you delete them. Here is a 13-year archive of articles about Outlook and Exchange. From both a user's and administrator's perspective. The suggestions come from Slipstick.com, so you know they're good. The publication is available both as an e-mail newsletter and with RSS distribution. "The High Technology Crime Investigation Association (HTCIA) is designed to encourage, promote, aid and effect the voluntary interchange of data, information, experience, ideas and knowledge about methods, processes, and techniques relating to investigations and security in advanced technologies among its membership." One of the locations for information about Outlook and Exchange is OutlookPower.com. "How you can print the comments contained in your Outlook Calendar. Outlook Calendar has various printing options to choose from that provide some editing capabilities. With the Calendar Details printing style, the notes area would be printed along, with all of the other Calendar details. Plus, this style will allow you to choose a range of dates to print, and gives you the option of printing each day on separate pages or continuously. To change the printing style, select Print under the File menu. Next, select the print style you would like to use e.g. Calendar Details style. If you would like to edit this print style, select Define Style then Edit." Outlook Express is not Outlook Lite. It's a separate free program included with Windows. Its claim to fame has been that it could be used to read newsgroups. Most groups are now available in HTML, and blogs, so that is not as important anymore. Some people prefer Express because it has less baggage than the Outlook that is part of the Office suite. Learn how to use Outlook Express to stay in touch with friends and family, and share information in newsgroups with other users like you. Here's a simple suggestion that sounds silly to begin with, but may come in handy in the future. Write down your email addresses! Created by an ISP when setting up an Internet connection. Email aliases created on your behalf. Web based email addresses with Hotmail, Yahoo, Gmail or many others. Remember your old AOL/CompuServe addresses? Tired of Hotmail, MSN, AOL, Gmail.com domain names for email addresses? You can pick up a new address; such as MyName@Live.com. If a contact item has an address in the United States, you can use your Internet connection and Outlook to create a map to the address. You must be connected to the Internet for this feature to work. Next to the Address text box, click on the down arrow and select the address you want to map (Business, Home, or Other). Then choose Actions/Display Map Of Address from the menu bar or click the Display Map Of Address button. Your default browser opens and the map is created using Microsoft Expedia Maps. In Outlook 2007, the Map button is on the Contact tab on the right side of the Communicate group. 2007 uses Maps.Live.com. You can edit the registry to enable another web-based mapping service. The scofflaws of the world are littering e-mail boxes with fake messages that look like the real thing. They're fishing for your bank account keys. A company named MailFrontier.com has an anti-spam/anti-phishing product. They also have a collection of Phish mail with instructions about how to respond. By editing the subject lines of messages you receive, you can organize your mail. If you get faxes or voicemail sent to you automatically via email, you can change the subject to something that makes sense to you. Open the message, edit the subject line, close the message and, when prompted, save the changes. The trick with this is the subject line does not look editable because it is on a grey background, but it works nevertheless. Rows, enable the Allow In-cell Editing option. and enable Allow In-cell Editing. Here is a similar one for Outlook. It's not as robust and it does not install a new tab, but it's a start. "If you're buried in e-mail (and who isn't? ), Instant Search in Outlook 2007 can save the day for you - every day. The new Instant Search helps you quickly find e-mail messages, appointments, contacts, or any Outlook item. You don't even need to know which folder the item is in. Watch the demo to see how to use this fast search feature, and start finding what you want instantly." "Espionage and email: as the Pentagon discovered, the two often go hand in hand. Following the arrests of two U.S. servicemen suspected of spying, the Pentagon is broadening its investigation of possible espionage activities at Guantanamo Bay, Cuba. According to CNN, at least one of the security cases has involved suspicious emails that were discovered as part of a routine monitoring process." Who Owns Your Company's E-Mail? If you are involved with a project, or you do a lot of work in a specific area, you may wish to create separate folders for e-mail related to that assignment. You do not have to limit yourself to creating folders for e-mail; you can also create new Calendars or collections of Contacts. One way to do this is to go to View>Folder list. Select the "Root" of the directory tree, or choose a folder to create a sub-directory. Give it a name and then choose what information that folder should contain. You can have a Contacts folder with names from a single company, or your personal list. This way they will not be intermingled with your main collection. You can do the same thing with personal Calendars. Does the font used in an email message color the perception of the reader? "Summary: This study investigated the effect that a font has on the reader's perception of an email. Based on a previous study by Shaikh, Chaparro, and Fox (2006), a sample email message was presented in three fonts (Calibri, Comic Sans, and Gigi). The three chosen fonts represented a high, medium, and low level of congruency for email messages. There may be some comfort in Outlook 2007. 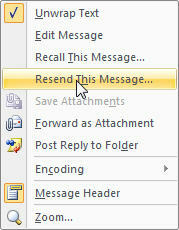 Except for composing E-mail messages, Outlook '07 uses the familier toolbar/menu UI we're used to. There are some changes, however, and this link to MSDN explains why they were updated. Description: The Personal Address Book, an ANSI address book that is part of Outlook 96, is removed. The Personal Address Book was replaced by Outlook Contacts in Outlook 97. Personal Address Book entries were stored in the local computer files with the extension .pab. Office Outlook 2007 does not support .pab files. During configuration, all contacts in the Personal Address Book are migrated to the default Outlook Contacts folder. Customers can choose to move their contacts to a different folder, or to cancel the migration and import the .pab file later. The .pab file continues to exist in the file system, but the Personal Address Book is not Accessible from Outlook. Customers cannot re-add the Personal Address Book, because Outlook does not provide this as an option in the E-mail Accounts configuration. Reason for change: Outlook Contacts provides more functionality than .pab files. 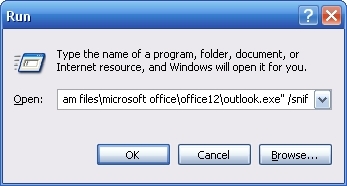 Migration path: Office Outlook 2007 migrates the .pab file during configuration.